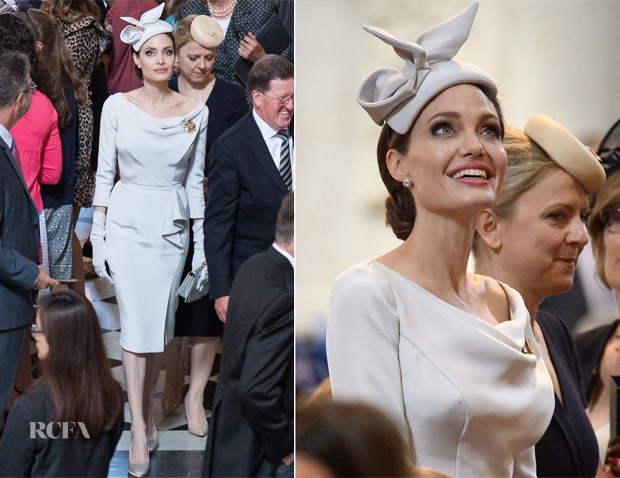 Angelina Jolie attended the 200th anniversary Order of St Michael and St George service at St Paul’s Cathedral on this morning (June 28). The actress look regal wearing a custom Ralph & Russo Couture dove grey dress with a cowl neckline which was fit for a Duchess. The classic design, which sat off-the-shoulder in a smouldering manner, was styled with Ralph & Russo ruched gloves, a silver ‘Eden’ classic clutch and ‘Eden’ platform pumps. Like Ciara, this is another perfect example of how to dress for a royal occasion, even if I could’ve perhaps lived without the gloves. I know some of you may think this would be perfect for Meghan, Duchess of Sussex, but I think this would be better suited Catherine, Duchess of Cambridge better.